The result we combined with the right fortune Tarot card, the widower. An older, caring and polite man will to contact you today. You will be impressed by him, because he has a lot of life experience and he will help you with a problem. Be friendly and open up to this gentleman, but never forget that you have to fight with your life problems alone. A man from the business world meens it good with you and today he will start to promote and encourage you. It is an older man who already has a lot of experience in your working field and he appreciate your efforts and your hard work. With this man, you can make long-term business and you will feel safe. If you are a man, then this card shows you that you mourn old relationships and sometimes you also sink into self-pity. You must try to wake up from this lethargy and take your life into your own hands. Plan your life and go your own way and not just listen to the advice of friends. 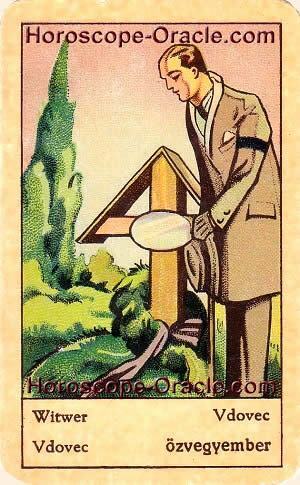 If you are a woman, then this card means that you will meet know an older, shy and polite man. Start this relationship slowly. Friendship is often more worth and lasts longer than a relationship. The widow is an elderly man with a lot of life experience who is friendly and polite. He is very close to you, or he will be soon. If you are a man, then this card you can also represent yourself as an rather incommunicative person who is living in the past.